Currently, there are approximately 11 million undocumented immigrants in America. That number includes nearly 800,000 registered Dreamers and some advocacy groups estimate that they are part of the over 1.8 million immigrants who potentially qualify for DACA including over 100,000 young immigrants from Asian countries. Although the vast majority of Americans (including three-fourths of Trump voters) support federal protection for Dreamers and a majority oppose repeal of DACA, the fate of America’s Dreamers remain precarious under Trump. This news coincides with threatened legal action from the governors of ten conservative states who say they will sue the federal government unless the president repeals DACA. Those governors have given Trump a deadline of September 5th to begin phasing out the program. If the president chooses to end DACA — either because of pending legal action or in retaliation for not receiving funding for his “great wall” — hundreds of thousands of registered Dreamers will lose employment authorization (ending their ability to work and earn a living), and they will face imprisonment in an ICE detainment facility as well as eventual deportation. The lives and livelihoods of Dreamers and undocumented immigrants are not political bargaining chips to be treated callously. Immigrants are not political pawns to be traded transactionally by an uncaring and xenophobic president and his administration. All immigrants deserve the stability of legal status and the opportunity to build a future in America. It is imperative that in the coming weeks, we join immigrants rights activists in rallying to the defense of DACA and TPS. Mean-spirited anti-immigrant politics and the Trump Administration’s constant attacks on immigrant communities is reaching a crisis point. Two critical programs – the Deferred Action for Childhood Arrivals (DACA) and Temporary Protective Status (TPS) are in danger. 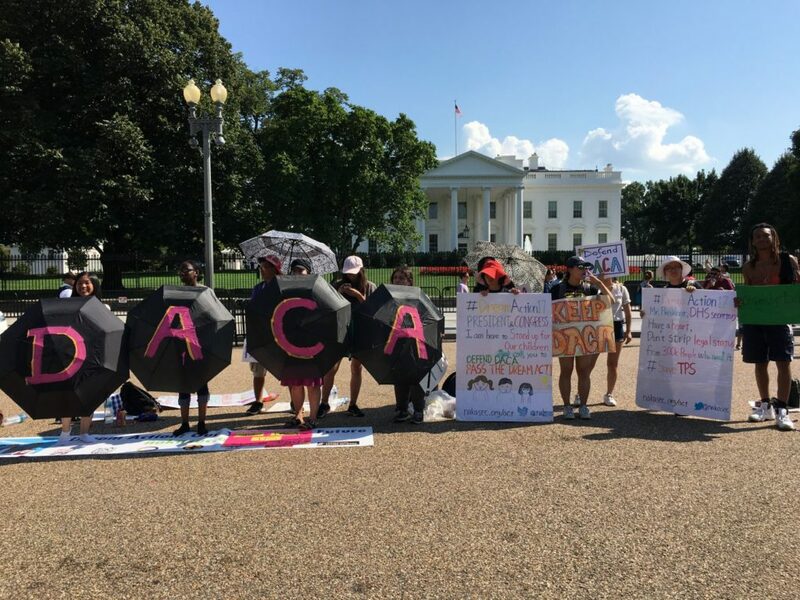 DACA is under imminent threat of lawsuit by TX Attorney General along with nine states, and TPS is facing threat of cancellation by the Administration. DACA provides eligible immigrant youth the chance to live, study, and work without fear of deportation for a temporary period. Nearly 800,000 young people are currently pursuing their hopes and dreams, freed from constant fear of getting torn from their families by immigration enforcement, thanks to DACA protection. Similarly, Temporary Protective Status (TPS) has opened hundreds of thousands of opportunities to approximately 400,000 people, but may not be renewed for Haiti, Honduras and El Salvador. 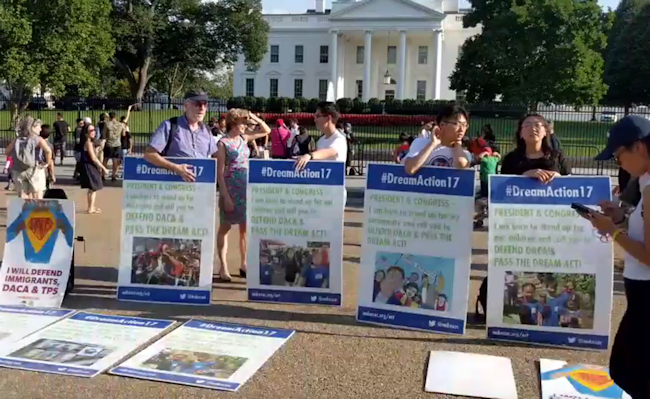 You can view a live stream of DREAM Action here and support the activists’ efforts by making a donation, signing this petition, registering to vote, sharing your story, or tweeting to #DREAMAction17. Also, if you are in the DC area, please stop by the front of the White House to join the vigil and lend your support to activists!